Build a tree of flat pages, with a WYSIWYG editor. Build a tree with widget-based pages, by integrating django-fluent-contents. Build a tree structure of RST pages, by defining a RstPage type. Build a tree of a homepage, subsection, and article node, each with custom fields like professional CMSes have. Each node type can have it’s own custom fields, attributes, URL patterns and rendering. In case you’re building a custom CMS, this module might just be suited for you, since it provides the tree for you, without bothering with anything else. 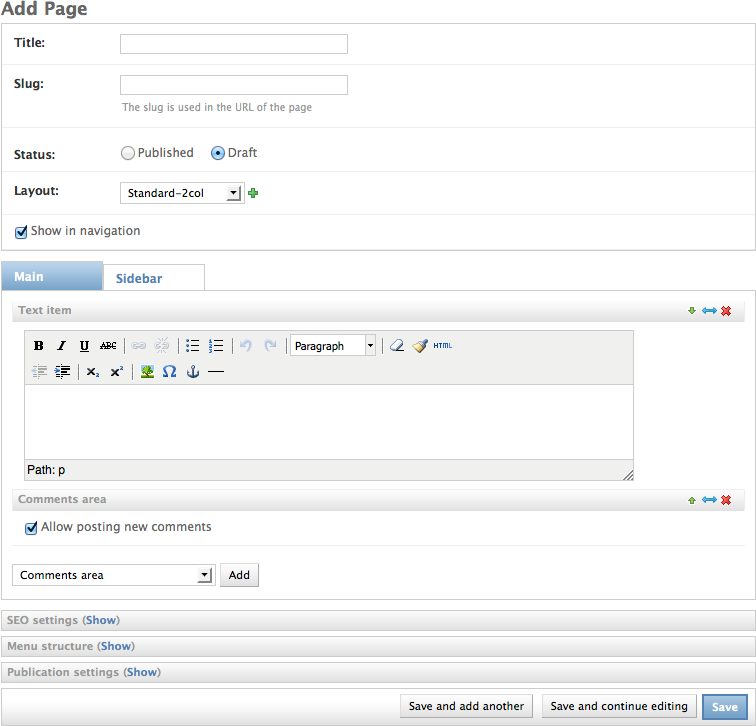 The actual page contents is defined via page type plugins. To get up and running quickly, consult the quick-start guide. The chapters below describe the configuration of each specific plugin in more detail.